"Belinda's Soul" is a simple study in pen and ink. This artwork study is modeled from a series of photos taken by Danish photographer, Flemming Jacobsen. 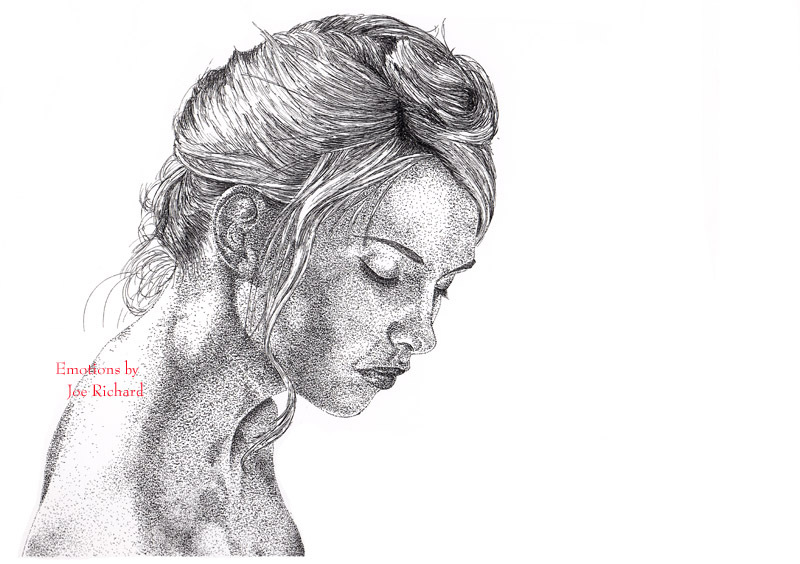 The use of varied pen nubs in completing the stippling combined with strong line work for the model's hair offer a pleasing contrast to the overall pen and ink techniques used throughout this study. The artwork in pen and ink techniques was completed in January 2007. This piece took approximately 12 hours to complete and measures about 8 x 10 inches on an 11 x 14 background. Above is the photo used in completion of this study in pen and ink. The photo, "Belinda's Soul" is from a series of photos taken by Danish photographer, Flemming Jacobsen. His lovely model is a young Danish woman called Belinda. Mr. Jacobsen's website is written in Danish, however, Mr. Jacobsen's photo galleries are captioned in English. As a budding artist, I wish to extend my sincerest gratitude to both Belinda and Mr. Jacobsen for allowing me to undertake the opportunity of putting the photograph "Belinda's Soul" on paper.